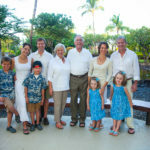 This family portrait in Hawaii was taken at the Mauna Lani Resort. We did the whole extended family as well as doing individual family groupings as well. The Mauna Lani resort offers so many different background options from waterfalls, palm trees, hawaii foliage, and of course beautiful ocean and beach backdrops. After the formal family portraits, we also took some candid photos of the kids playing in the water together.